The federal price tag of Bernie Sanders’s proposal is not surprising. But the implications are kind of insane. Bernie Sanders’s “Medicare for all” proposal is receiving new scrutiny because of an estimate released this week by economist Chuck Blahous of the right-leaning Mercatus Center. Blahous projects that the plan would cost the government $32.6 trillion over 10 years but also reduce the country’s overall level of health expenditures by $2 trillion. 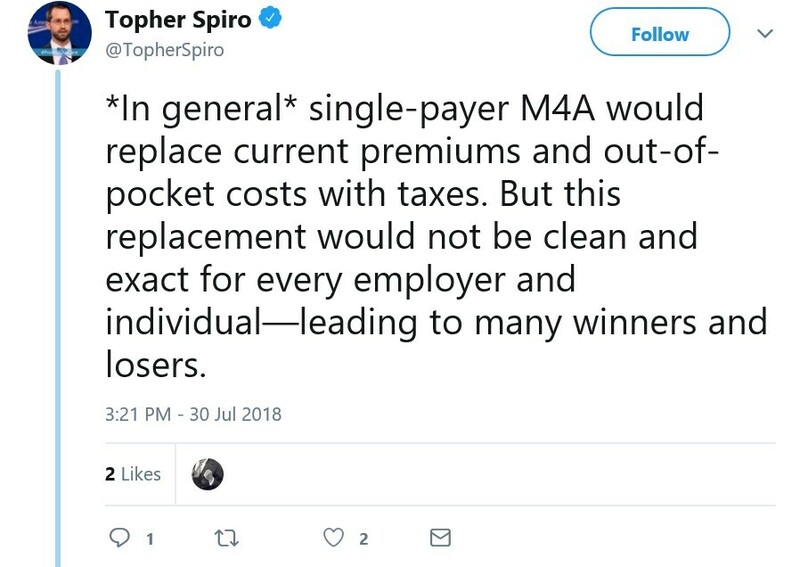 “M4A” advocates say that these numbers are two sides of the same coin: that because the program would redirect spending for health care to the government and lower aggregate expenses in the economy, the exorbitant cost to taxpayers would be, as multiple left-leaning analyses have put it, “a bargain.” But Blahous’s research of the Sanders plan, like that of his contemporaries, is loaded with assumptions and caveats that reduce conclusions about the idea’s cost-saving to speculation. If anything, it’s fair to say that the research shows how M4A is a risk of historic price. For the average individual, the point of “Medicare for all” is to have federal tax revenue pay for health coverage that is comprehensive and basically free to use. Sanders’s proposal includes wide-ranging benefits applicable in “medically necessary or appropriate” circumstances and eliminates cost-sharing, meaning no copays, deductibles, or similar charges. The expense to households is less take-home pay: a new, de facto “premium” paid to Washington, maybe higher payroll taxes, and, depending on income level and economic behavior, higher income taxes from rate hikes. Similar trade-offs would appear elsewhere: Businesses would not offer their employees coverage under an M4A scheme, for example. But they, too, would have to foot the cost, through a higher corporate tax rate, potential taxes on their own behavior (like on carbon), and perhaps an employer-specific premium like the one paid by individuals. Some of these ideas are incorporated into Sanders’s thinking; depending on the bill’s projected cost, more of them may be necessary to compensate for the government’s expense. This is where Blahous’s work comes in. Whereas Sanders’s campaign forecast his M4A plan to cost $1.38 trillion per year, Blahous projected that number to be more than double, at $3.26 trillion, in the paper he published on Monday. “For perspective on these figures, consider that doubling all currently projected federal individual and corporate income tax collections would be insufficient to finance the added federal costs of the plan,” he wrote. His assessment met skepticism from some in the press, given Mercatus’s affiliation with the Koch brothers. Notwithstanding the sloppiness of such a charge—Mercatus is directed by a world-class economist respected across the political spectrum, Tyler Cowen, and Blahous’s paper was peer-reviewed and reflected his own research, regardless—Blahous’s findings were similar to the Urban Institute’s, a well-regarded and left-leaning think tank that examined the Sanders proposal in 2016. Its 10-year federal cost estimate was $3.20 trillion a year. The Urban Institute economists ran their numbers based on the Vermont senator’s framework for Medicare for all. But Sanders introduced his legislation in the Senate last year, which provided Blahous more specifics to analyze and alternative scenarios to consider. For example: Sanders’s plan caps reimbursements to physicians and hospitals for services at the Medicare reimbursement rate, which is significantly lower than reimbursements under private plans (but higher than those under Medicaid). 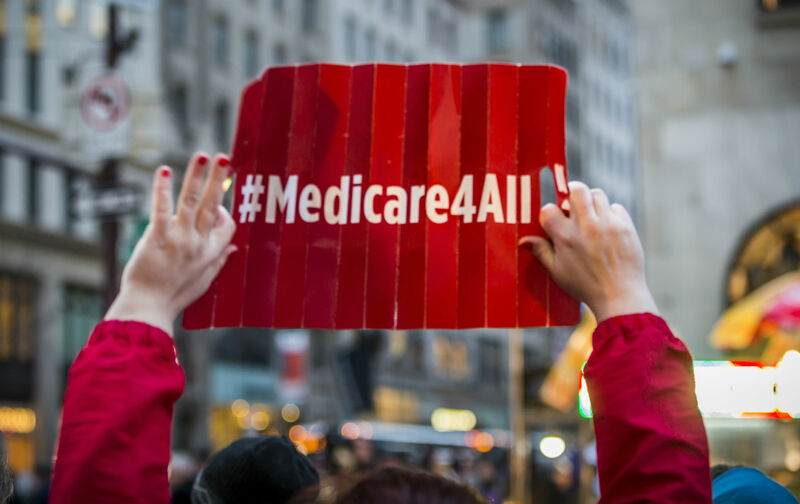 “In 2014, Medicare hospital payment rates were 62 percent of private insurance payment rates and are currently projected to decline to below 60 percent by the time M4A would be implemented, and to decline further afterward. Medicare physician payment rates were 75 percent of private insurance rates in 2016 and … are projected to decline sharply in relative terms in future years, also falling below 60 percent within the first full decade of M4A,” Blahous writes. The surprising finding in his study is that Sanders’s Medicare for all bill would decrease national health expenditures (NHEs) over the next decade by $2 trillion. Many M4A advocates celebrated this estimate, given the unlikely source of it. But there are two things to keep in mind. One, national health expenditures are different from government expenditures: They comprise aggregate spending on health care in the United States, in both the private and public sectors. (They have a specific definition, per the Centers for Medicare and Medicaid services, available on Page 6 here.) Two, while keeping reimbursement rates at the relatively low Medicare level would help contain the total dollar figure of NHEs, it also would jar the finances of medical providers. “Perhaps some facilities and physicians would be able to generate heretofore unachieved cost savings that would enable their continued functioning without significant disruptions,” writes Blahous. “However, at least some undoubtedly would not, thereby reducing the supply of healthcare services at the same time M4A sharply increases healthcare demand.” Difficulty accessing care “almost certainly must arise”—which is not a controversial statement, but mere economic intuition. Anticipating this scenario, Blahous runs the numbers keeping reimbursements to providers and physicians on pace with current projections. This situation results in an annual cost to government of $3.80 trillion, not $3.26 trillion—and a net increase in NHEs of $3.25 trillion over a decade, instead of a decrease of $2.05 trillion. This represents a range of realistic outcomes, and given political and economic realities, something close to the alternative payment arrangement has to be considered a likelihood. Of course, all this discussion pertains only to finances, not the pluses and minuses of access and quality of care: low-income individuals getting covered, but consumers demanding more care while suppliers shrink the availability of it, for instance. It also does not consider how the goalposts of whether the public scores a good deal with M4A could move. Jacobin magazine called the Sanders plan “a bargain” based on Blahous’s score, since “[w]e get to insure every single person in the country, virtually eliminate cost-sharing, and save everyone from the hell of constantly changing health insurance all while saving money.” But what if the public doesn’t save money, as in the alternative scenario Blahous evaluates? The same advocates could argue so what?—even if the public is paying more money on net, it’s doing so in the cause of insuring 30 million more people. They could frame those numbers as being worth it. Medicare for all would represent an historically large cost shift between the American economy and federal government. Simply citing the budget impact of such a proposal—$32.6 trillion over a decade—to invalidate the merits of the idea cuts the debate unjustifiably short, as left-of-center critics have stated. But incorporating the other financial aspects of M4A does not cinch their case. It instead complicates it, undermines it, and brings the debate about American health care back to philosophical grounds. Does the public believe Washington should have total financial control of the market, to the tune of more than $3 trillion in tax revenue a year? Does it trust Washington to allocate those taxes fairly? And given the range of outcomes for reducing health costs—to the point it may not reduce them at all—does it believe that such a transition merits the risk? ← The Health 202: ‘Medicare for all’ is the dream. ‘Medicaid for more’ could be the reality.